This week James was in Milan to operate Catalyst for Samsung’s new touch screen phone’s European launch. The phone, named “Corby” in Europe and “Genio Touch” in the UK is being pitched with the line “What colour is your life?”. Jack Morton Worldwide produced the show with XL Video providing projection, Barco Encore, Catalyst and crew. Catalyst was used to drive two independent four projector edge blends either side of the catwalk. These were projected from above onto the floor to show on the Musion screen flanking the catwalk. Musion gives the impression of a hologram on stage using the Pepper’s Ghost principal. Four Catalyst machines were used to drive a pair of projectors each, with a fifth as backup and audio machine. These were controlled using Basic Monkey’s Jands Vista S3 which James finds to be the best console to trigger Catalyst from, allowing quick alterations using the unique timeline editing. The screens were used to play four intro videos, each demonstrating a different colour through virtual characters interacting with real dancers. Added to this was ‘Vision Blob’ where a calibrated camera was used to track a dancer’s position on stage and use this information to let the dancers interact with balloons or produce a glow around them. In the main show, Catalyst was used to play a series of video intros for each section which then became backgrounds for the presentation. Clips highlighting each section, including animated text and phone graphics were cued in line with the script. These Catalyst clips were intermixed with live ‘Gesture’ content. For product demonstrations, the presenters were able to interact with the content using the ‘Gesture’ system designed and implemented by D’strict. Using infra-red sensors in the stage, the presenters could use hand movements to trigger and manipulate the phone images in front of them. This ‘Gesture’ interaction was generated from four computers, each fed into a DVI matrix, converted to HDSDI and then split into the Catalyst machines. 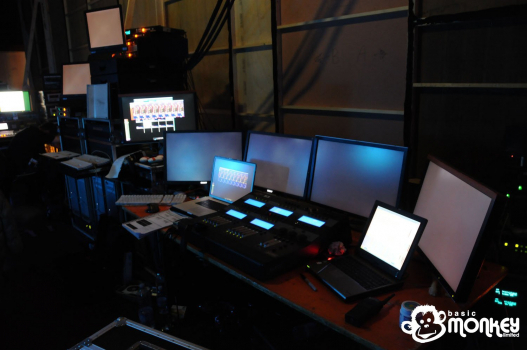 James mixed the video cues and backgrounds with the ‘Gesture’ content live to allow for changes in show pace. Due to the late sign off of the content, James only had access to the converted and sized video files the day before show. This meant rapid programming during the rehearsals and a rather late finish! Completion of programming in time is testament to the flexibility of the Catalyst and Jands Vista combination. The vastly complex signal path was designed by Jonathan Bond of Vision Mill and implemented/adapted by James to meet the ever changing requirements of D’strict. It was a pleasure to work on the event, despite the highly demanding show, content and time constraints. The show was well received by the press, prompting a standing ovation and an invitation from Samsung to repeat the show in Korea in November. Rob and the team from Jack Morton Worldwide have asked James to run Catalyst again in Korea.